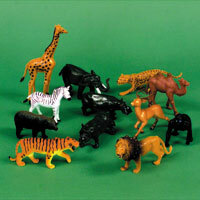 Great assortment of animals. Impressive details. Plastic. 5 to 7 inches. $6.80 per dozen for 18 dozen or more. $6.10 per dozen for 36 dozen or more.